This strawberry banana smoothie is my go-to smoothie recipe… The smooth and creamy consistency makes it seem like such an indulgent treat, but it’s packed with protein and calcium! This is a sponsored conversation on behalf of Walmart; all opinions and text are my own. Thank you for supporting the brands that support this site! Greek yogurt is one of those must-have staples that’s always on my grocery shopping list. Just between smoothies and “yogurt parfaits” (simply Greek yogurt topped with nuts, fresh fruit, and a drizzle of honey), we go through quite a bit each week! But we also use it as a substitute for sour cream and mayonnaise. When it comes to plain Greek yogurt, you’ll find a lot of choices at the grocery store. In fact, it can be a little overwhelming… I’ve pretty much tried them all, and I always come back to FAGE Total Plain Greek yogurt. My favorite is the 2% variety, but the nonfat variety is quite good also. I use FAGE Total Greek yogurt regularly when cooking, as well as in this classic smoothie recipe. The thick texture and tangy taste make it perfect for both sweet and savory applications. Wanna give it a try? You only need three more ingredients to get started: fresh strawberries, a ripe banana, and honey. Simple, easy, and delicious! I use a 1:1:1 ratio — 1 cup of FAGE Total Greek yogurt + 1 cup of fresh strawberries + 1 ripe banana — then add honey to taste. Layer it all in your blender, process, and pour! Could it possible get any easier? Actually, it can… You can also freeze all of the ingredients (including the Greek yogurt!) to make frozen smoothie packets that you just dump into your blender whenever a smoothie craving hits. But while strawberries are still in season, fresh is the way to go! PIN IT NOW! CLICK HERE TO ADD THIS FRESH STRAWBERRY BANANA SMOOTHIE RECIPE TO YOUR SMOOTHIE RECIPES BOARD ON PINTEREST! This fresh strawberry banana smoothie is my go-to smoothie recipe… The smooth and creamy consistency makes it seem like such an indulgent treat, but it’s packed with protein and calcium! Add Greek yogurt, strawberries, banana, and honey (I start with about 1 tablespoon) to your blender. 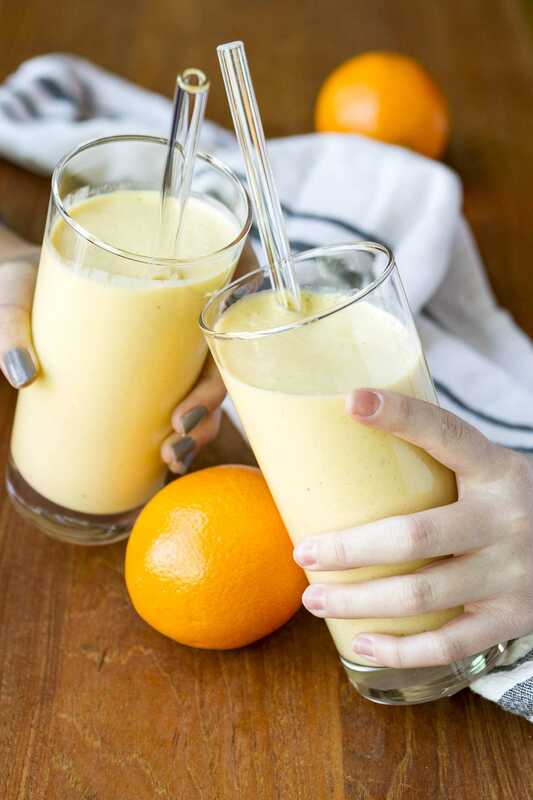 If you love this fresh strawberry banana smoothie recipe, I think you’ll adore this orange mango healthy citrus smoothie recipe! It’s packed with ingredients that will help keep your immune system in top shape for fighting cold and flu… Added bonus, it tastes AMAZING! I’d love to see how your fresh strawberry banana smoothies turn out… Tag me @Unsophisticook on Instagram or use the hashtag #Unsophisticook so I can check them out. Enjoy! Fresh Strawberry Banana Smoothie Everything I need for this summer, refreshingly nourishing. I love to drink strawberry and banana smoothie so it’s very good, the whole family loves it, and the cool thing is that in two little girls you do it and it’s ready and it does not take many kids, perfect for a quick swim too.